Did you ever find yourself in the need of sending across big files across to your friends, then the only option is to upload the files to the cloud storage services like DropBox or any File Upload sites.Many file upload sites require user registration to use their services and the data upload process is not secure.Here’s another file upload and sharing but with many features many free would want but can find only in PRO Accounts of many Cloud storage services. Download links for the files can be sent to 20 recipients at once. 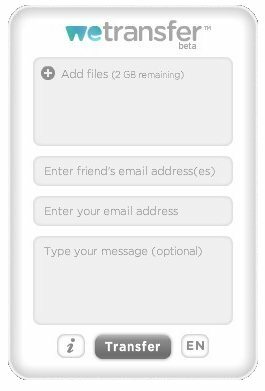 In the first email you receive are the download links along with an option to forward the same files to others without the need to re-upload the files again,Clicking on the Forward button opens up a new window with the files listed, and requiring you to just enter the email id’s to forward and that its the files are sent.All transfers are secure on WeTransfer as it and all download links sent are unique to each recipient making it difficult to guess file names to download directly from the server.The inbox is itself the control panel, from where you can download the uploaded file, forward it, receive confirmation on recipients downloading the files.All emails have the date mentioned until which the files would be available for download. Head to WeTransfer, and you should be greeted with a box in the middle of the screen and auto changing background images where are ads. Click the Transfer button which should start uploading the file and confirmation is shown once the upload is complete and the email sent. 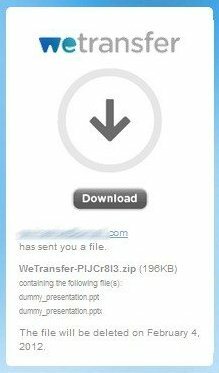 Once your recipient’s start downloading the file, you should receive confirmation mails about their downloads which makes it even more easier than an email to track, if the file(s) were downloaded or not. Note : It always better to transfer file(s) securing them with password protection on the internet. Do share your experience if you used WeTransfer or if you know of any such similar service. There is also another service. https://sendgb.com. Send files up to 10 GB. No registration needed!